Heidi Bishop is an accredited paper filigree artist in Washington state who I've known for several years. She's always on the go... teaching, doing juried shows, and many custom orders. Her style is elegant and feminine, and she often uses tiny pearls and seed beads to accent her work. You can imagine my surprise when I saw her newest piece, the bold and vibrant Serengeti. When I asked Heidi how she came up with such an unusual perspective, she told me she heeded a remark her young daughter's photography teacher had made - something to the effect of "A pattern is interesting and eye catching, but a pattern broken is sheer drama." 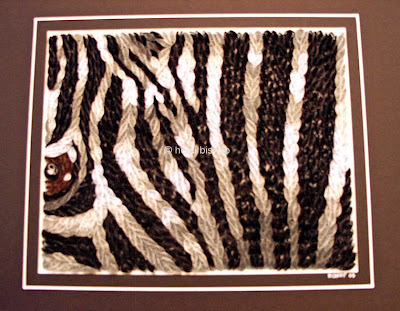 When an art critic proposed the question...to crop or not to crop, Heidi took it as a challenge and reduced the size of a zebra photograph to its most "a pattern broken" element. Follow Heidi's latest ventures in her blog Paper Filigree with a Pedigree.